Did you know that Budapest used to be two cities (Buda and Pest)? We didn’t until we arrived there! The Danube River that we came to love in Bratislava separates the two cities that were merged to become a single city on opposite banks of the river in 1873. We happened to be staying on the “Pest” side, which is unfortunately to the East because it would have been fun to stay in the Pest to the West (dad joke)! Our home during the short six-day stint was the Sun Resort Apartments. This newly built, well-run and affordable complex is situated in the 8th District, which used to be one of the rougher districts in Budapest. In recent years, however, it finds itself in a period of growth and revitalization and is continuing to shed the bad rap from the past. The 8th District is now known for it’s jazz music, art galleries, and trendy cafes. It is also home of the Corvin Plaza (a well-kept collection of shops located right outside of our building) which was hosting an inaugural beer festival on the day that we arrived! Happening upon beer fests seems to be a specialty for the Kimbles. And we’re okay with that! 1. Visit Margaret Island (Margitsziget): This island is located in the middle of the Danube, nestled between Buda and Pest. There is a 5k-long track outlining the coast of the island, which is perfect for running, walking or biking! If you come on the weekend you can enjoy a fountain water show set to music. 2. 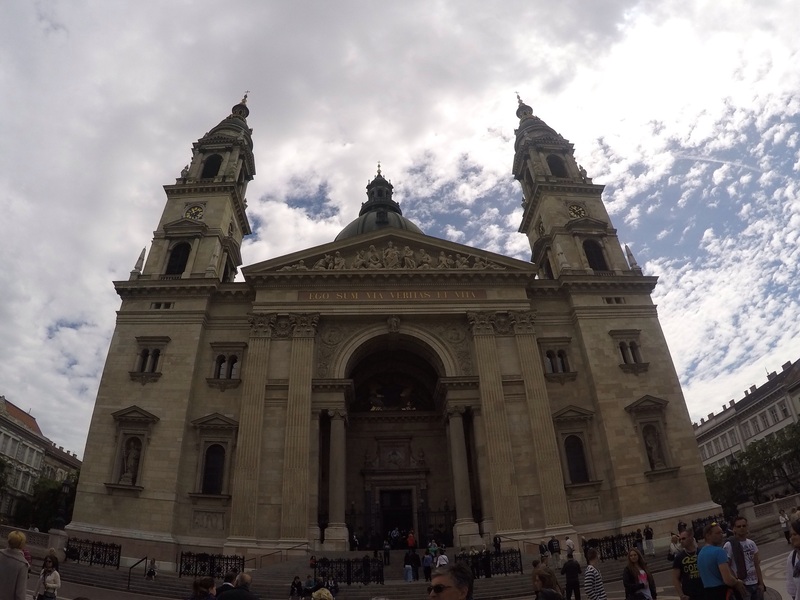 See the Beauty of St. Stephen’s Basilica: This is the largest church in Budapest, dedicated to Hungary’s first king. Karen and I attended mass here and it was the most beautiful basilica we have ever seen! Whether you want to participate in mass or just take pictures inside, it’s worth the visit. Fun fact: the basilica is one of the top 10 most photographed places in the world. 3. Have Dinner and Drinks at a Ruin Pub: The popularity of ruin pubs (bar-restaurants located in previously abandoned buildings) is still on the rise in Budapest. We ate at Mazel Tov, a Mediterranean-style pub which looked more like a wedding reception venue than an abandoned building! The food and atmosphere were excellent and there was live music to boot. 4. 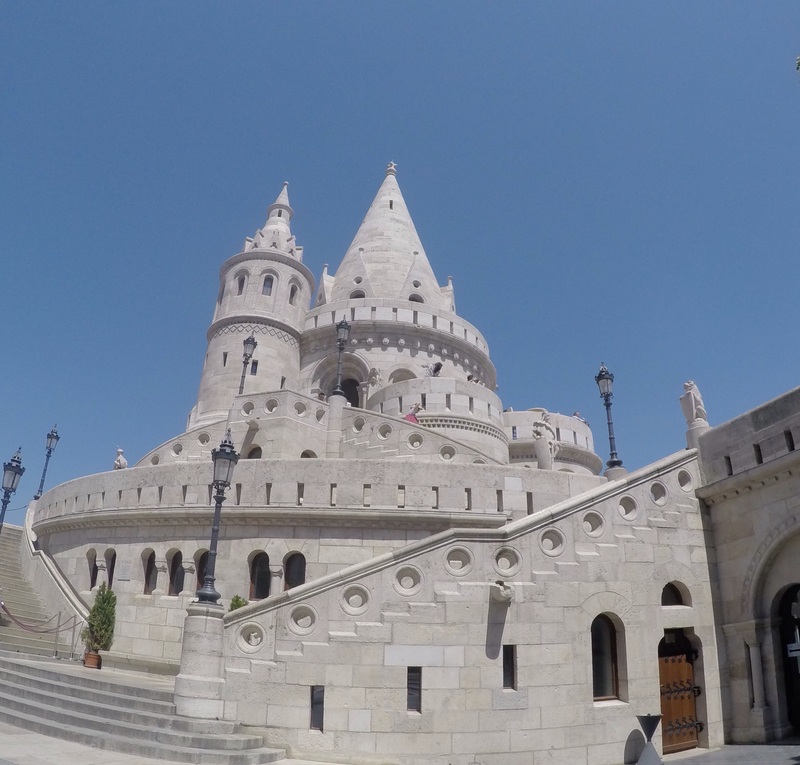 Walk Through Fisherman’s Bastion (Halaszbastya): This place looks like the Hungarian Disneyland! Built between 1895 and 1902, this architectural treat features seven towers representing the seven Hungarian chieftains who led their tribes to settle in Hungary. If you’re looking for the best views in the city, this is where to go! Fisherman’s Bastion in all its Disney glory! 5. Eat pizza at the Local Korner: Great pizza, better service. That should be the motto of Local Korner. It’s a delicious pizza place run by three young friends who know what it means to deliver good service. Like many restaurants in Budapest, they have a “drive-up” window where you can walk right up to the side of the building and order pizza by the slice directly from the window. We chose to go inside and order up a specialty pizza, which we then took home because there is a very limited dining area (one table). While we waited for the pizza, we were offered shots of vodka on the house and asked multiple times if we wanted coffee or anything else to drink. We enjoyed it so much that we ate here twice! To see these sights come to life, check out our newest video below or subscribe to the “Kimblesinbits” YouTube channel! I feel dumb for not anticipating your song choice on this one…. Miss you guys! Glad you appreciate the song choice, Lori! We miss you too!! Yes I did know it was two cities, that is information gained sitting in World Geography class for several years. Have enjoyed all your posts,and shared a few with my freshmen WG students during study hall. I will keep reading, safe travel.